I had a 3 land hand, but no green. On turn three I played a Taiga and some elves. Turn four I played an Oracle of Mul Daya and a Thunderscape Familiar. Atraxa was ramping like crazy into an early Elspeth, Knight-Errant, and then a Static Orb (I HATE that card). On turn 6 I’m able to play Saskia and attack Reaper King to also hit Elspeth and prevent her ultimate. However, it’s pretty hard to play through not getting to untap most things. I lose to a single hit with a 21/21+ Atraxa. This is an all-Creature deck. Mostly big stuff that hits hard, with a few smaller guys to help fix mana and do tricks. I thought a bit about having each color play a different role in the deck, but ultimately just went with cool creatures. Jarad is a deck I was excited to play. I had the idea for it awhile ago, but ended up throwing it together in a day. This game was with a group of people I’d never played with before. One of them was a younger kid who showed up to play regular casual magic (and had only recently started); he borrowed a Kemba deck from someone, because it was straight-forward to play. I had a decent opening hand, but no green sources. I played a Crypt of Agadeem on turn one, and a Golgari Thug on turn 2. Turn 3 brought me a Kavu Predator. Kemba was very land flooded to begin with, and also didn’t realize that equipment could be cast without creatures in play, so we coached him a bit. Child of Alara dove right in with a Burgeoning, Strip Mine, Crucible of Worlds mess (frown), but Chorus of the Conclave was able to Oblivion Ring the Crucible. I played a Graveblade Marauder turn 4 and an Elvish Piper turn 6. Kemba started building up a bunch of equipment and using the commander to make a small army of Cats, and Chorus of the Conclave had a Behemoth Sledge and lots of ramping creatures. I piper-ed in a Colossus of Akros, and played a Sewer Nemesis (targeting myself). I was still only at 1 green mana at this point and had to use a Sidisi to tutor up a Bayou, so that I could cast Jarad on turn 10. Child of Alara was making good use of Knight of the Reliquary. On turn 12 I was able to use Jarad and sacrifice 20-power worth of creatures to take out Chorus and Child, but I mis-calculated how much Mana I’d need to recur AND monstrosity AND sacrifice the Colossus to also kill a basically untouched Kemba on the next turn. I also underestimated a combat trick, and ended up dying to the Cat Horde on Turn 13 (these were unlucky WHITE cats… forboding for game 200). This one is an “All-Creature” deck. Everything in it is a land or a creature, and it’ is heavy on basics in case I need to recur Jarad for cheaper. It makes use of solid Dredge creatures (I had to dip into my Jarad Ravnica-Block Guild Wars EDH deck to borrow the Grave Troll). The goal is to either smash with a huge Jarad, or drain the table with Jarad’s activated ability. It’s fun to self-mill with this deck, and is one of the few that I play that does that. I arrived to see the tail end of a Sisay vs Arcades battle, and decided it was a good time to also be playing a GW deck. I’ve been waiting to try out Karametra. Sisay’s player switched to Rhys (which, of course, prompted me to correct his pronunciation). I had a 2 land hand, but playable things, so I went with it. Playing a Scryb Ranger on turn 2 and a Gaea’s Herald on turn 3. A third land let me do Ranger tricks to get out Centaur Omenreader, and a creatureless Arcades made it so I could tap the Omenreader and get out Karametra on turn 5 with only 3 lands. Rhys had made a few tokens by this point. I followed that up with a Fierce Empath, that grabbed a Soul of the Harvest, but I had no reliable way to tap the Omenreader, as both opponents now had blocking creatures. Arcades dropped a Mana Reflection and Rhys had an Eldrazi Monument, so I Dust Elemental-ed back the ranger, herald and empath, and was able to play them all due to a tapped omen reader. I grabbed a Woodfall primus to take care of the mana Reflection. Then Rhys dropped a Gaea’s Cradle, so my Primus decided to attack Arcades, but, whoops, there was a 9/9 Prime Speaker and the primus died and persisted to kill the cradle. I played a Knight of the Reliquary, hoping to fetch my own Cradle to abuse with a Stone-seeder Hierophant that was in my hand, but at that point Rhys was able to swing with many huge flying elves and kill Arcades. I top decked the Archon of Can’t Attack Me, but Rhys had a Martial Coup and I had nothing I could do about it. It was a pretty fun game overall. The deck did what I wanted it to (but no Lotus Cobra action, or Stonecloaker). I had a Twilight Shepherd in my hand, but no mana to cast it, and it wouldn’t have saved me anyways. My only hope would have been to bounce and re-play the Woodfall Primus. Karametra is definitely my favorite of the New Gods (okay, actually, it’s Scott Free). Yes, this deck is about ramping lots of lands out with the God of Harvests, but I limited myself to only creatures and no artifacts (which was made possible by remembering that Stone-Seeder Heirophant is, in fact, a thing). It uses a lot of bounce creatures to get value out of other creatures (and Kara triggers) and only makes tokens based on Landfall. I did put an Avenger of Zendikar in the deck, but only because I had a spare Foil one lying around from the “Pack to Charity” binder from the 1st Commander Cast “Gifts Given” auction. Nykthos, Shrine to Nyx (or shrine to Nics) is the only non GW color-identity card in the whole deck. It really plays out like a combo deck, but it has a lot of math, searching and shufflling, so despite really liking it, it’s not one I would play often. It was my first game back after summer break, and I had recently de-sliver-ized my Animar deck (as previously played by my brother in this match) and since it was Game #50, I decided it was time to play this deck. I started with a Glitterfang, and was able to play Animar and a Phyrexian Walker on turn 3. Balthor played, Urborg, Bazaar of Baghdad, Cavern of souls and Coffers. I had great cards in hand and was poised to do awesome stuff, but Balthor accidentally got some manner of Infinite combo to happen really early. He said “oops, redo”. I started with Llanowar Reborn and good mana, an early Oracle of Mul Daya. My Azusa is countered. My Momir vig gets an Etherium Minotaur guy, but they all go away to Living Death. 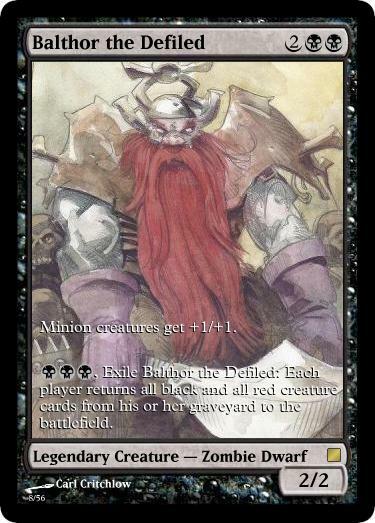 Balthor is Mana Drained by Merieke. Balthor is re-cast and Merieke decides to go test for Standard instead of finishing the game (conceding because other people showed up, not because of game-state). Balthor is eating my graveyard with a Withered Wretch, but I have my land-dudes back until Azusa is Skinrender-ed. I get a Magus of the Future and a Void-mage Husher. Balthor Beseeches the Queen for a Coffers and knocks me down to 13 with an attack, and then Damnations. I play a Spearbreaker Behemoth, but it gets sacced to a Liliana. 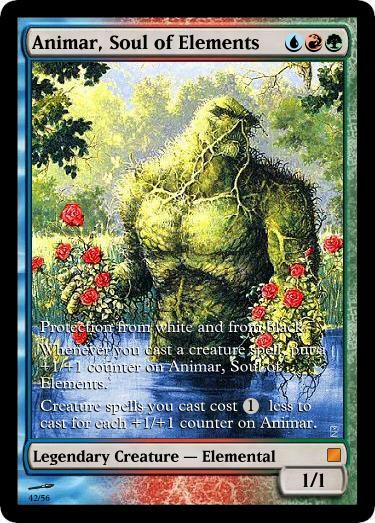 I transmute for Ruric Thar, but Animar is also somehow shuffled into my deck. Pontiff of Blight extorts me to 6, then 2 and I die to a swing. This one is definitely one of my 3 favorite decks. It’s one that I tinker with the most, so the above list is probably off by 4-6 cards. The deck is all creatures and lands and it is a lot of fun to play. It can have ridiculously explosive turns, but also long ones, so I don’t often play it more than once in a sitting. The Therosian Gods are all really good in the deck. I have pictures taken and will probably do a full post just about the deck at some point.